The festival of Naraka Chaturdasi(otherwise known as Deepavali, celebrated on October 18 in 2009) teaches man to remember how character decides destiny, designs achievements and demarcates one as either divine or demonic. Naraka, after whom this day is named, was a nara, human being. But since he grew into a demon, he earned the meaningful title, "Narakaasura." Through his asura (demonic)qualities, he proceeded towards Naraka or Hell. He was a king, who shaped his subjects through his counsel and commands into images of himself in wickedness. The people in his kingdom were intoxicated with vice and violence. The Lord decided to eliminate Narakaasura and redeem the people from the total ruin that faced them and guide them into the holy sattvic (pious)path of humility and goodness. Here, you must pay attention to a strange strategy that the Lord employed. The Lord invaded Narakaasura's kingdom, not once but again and again! Of course, He could have accomplished the asura's destruction during the very first campaign. But He did not do so. He forced him to explode into furious anger again and again, and each attack by the Lord made him repeatedly weaker. His resistance became feebler and feebler. Anger drastically reduces one's stamina. So, the Lord made Narakaasura flare up in anger, time and again, and even when he was rendered faint and flickering, the Lord decided that he did not deserve death at His Hands. 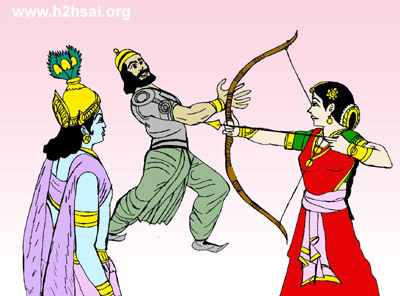 He took His consort, Sathyabhaama, with Him and directed her to kill the ruffian. She could do it easily, for three-quarters of his might had been subtracted by the Lord's strategy. This day (the festival of Deepavali) is set apart to commemorate the destruction of such a demonic person. The significance of this celebration is that on this day the Lord killed the darkness of Ajnaana (ignorance)andthelack of awareness of the Aathma (spirit)disappeared from the people. Where the light of Aathmic awareness shines, evil thoughts, wicked speech and vicious deeds flee in fear. Therefore, one should cultivate the wisdom which can cognise one's Reality.